The £2.8 million centre hosts a number of renewable and intelligent energy solutions. Through CEREB, students are exposed to the technologies which the built environment needs to embrace in order to provide sustainable buildings for the future. The Centre has direct access to data from all technologies providing services to the working building, together with the innovative technologies built into the Centre itself. There is also the ability to showcase developing technologies and to trial new products in a real life setting where the results can be closely monitored. This makes it an invaluable resource for understanding how to design, operate and manage technologies for future low carbon buildings - both new build and retrofit. The data from the monitoring systems is available via web interfaces that allow it to be used for collaborative research worldwide, giving the Centre an important international dimension. As an example, the management software may show energy flows, whilst on the roof the equipment can actually be seen in action. This makes it much easier to help people, including students, to understand how the technology works. The facility's flexibility means that as the technology moves, on the next generation of renewable energy systems can be analysed and compared. 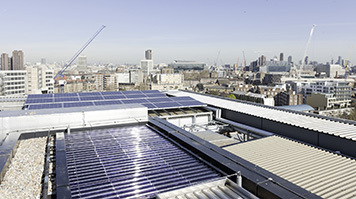 Currently, buildings produce 40% of UK carbon emissions, and at LSBU we are playing our part in reducing this. CEREB supports the teaching, research and demonstration of low carbon energy technologies in the built environment. We're also building our own Flexible Climate Simulator. With it we'll test and develop new techniques and systems for buildings: civil/structural engineering, renewable energy, and sport science and health. It will allow us to construct full scale and scaled environments to better understand climatic influence and be capable of controlling strict environmental conditions.